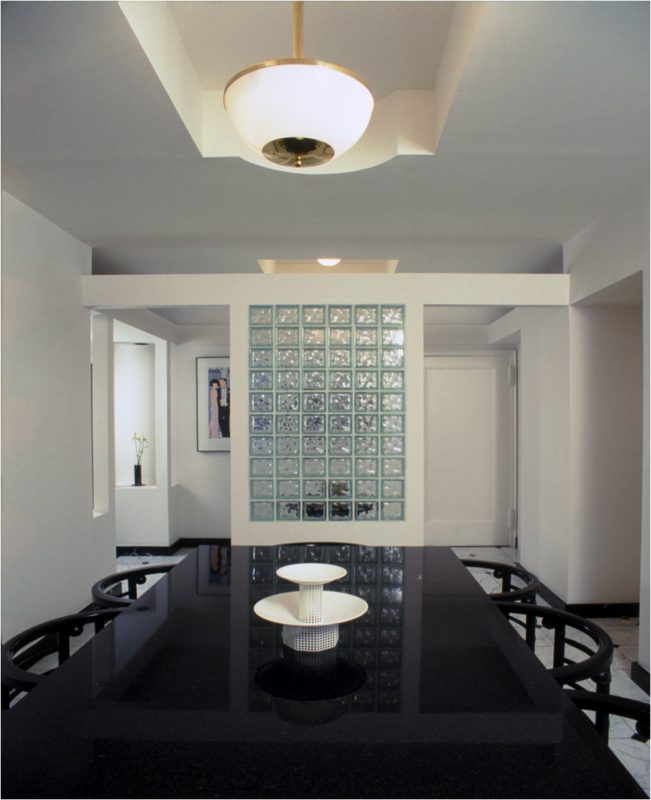 The ceiling may be considered the forgotten plane, according to Angelo Donghia, yet it is integral to creating a fully aesthetic and functional space. All the great architects through centuries past have 'looked up' and found an interesting surface to adorn. nterior designer/decorator and founder of Gail Green Interiors. 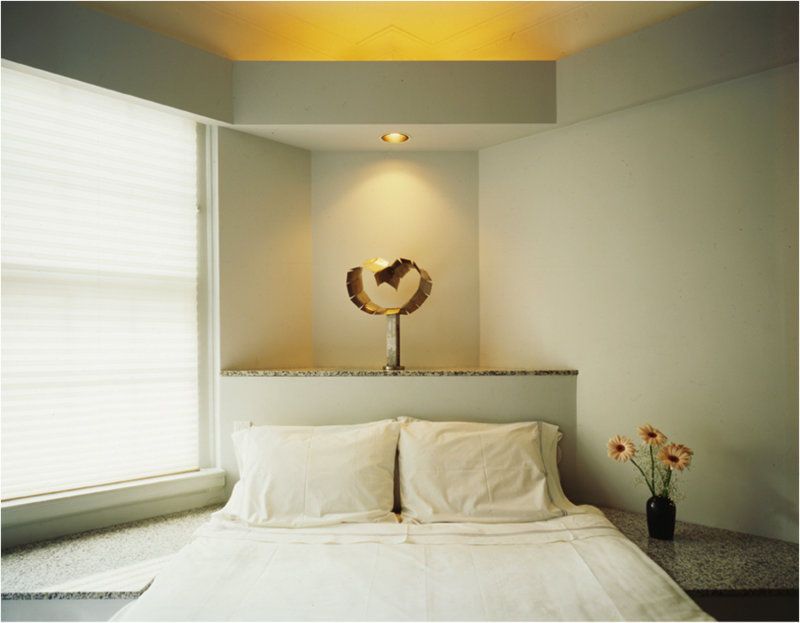 Author of AN INSIDER’S GUIDE TO INTERIOR DESIGN FOR SMALL SPACES. The ceiling may be considered the forgotten plane, according to Angelo Donghia, yet it is integral to creating a fully aesthetic and functional space. All the great architects through centuries past have 'looked up' and found an interesting surface to adorn. It seems that with the advent of the hi-rise apartment and its lowered top, the ceiling has seen better days. Not to despair. With all of the other five surfaces well explored, the design/decoration of the ceiling has much left to offer the design professional and enthusiast. 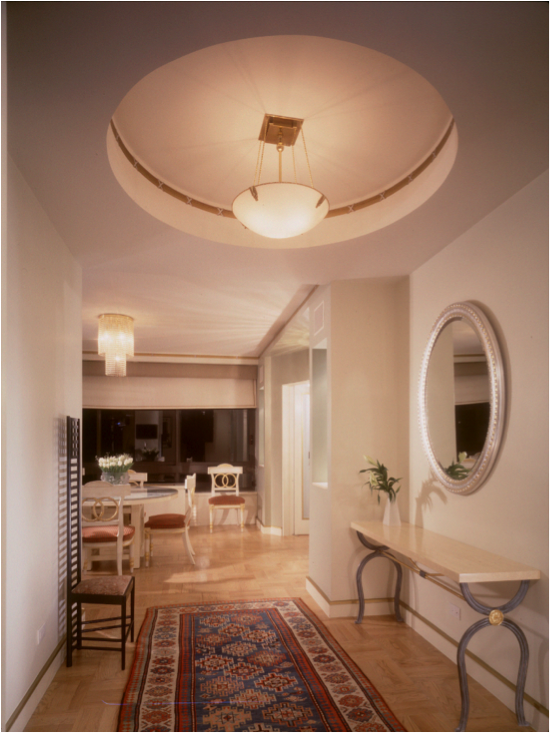 When the ceiling is looked at as yet another surface on which to create design magic, it increases a home's value. 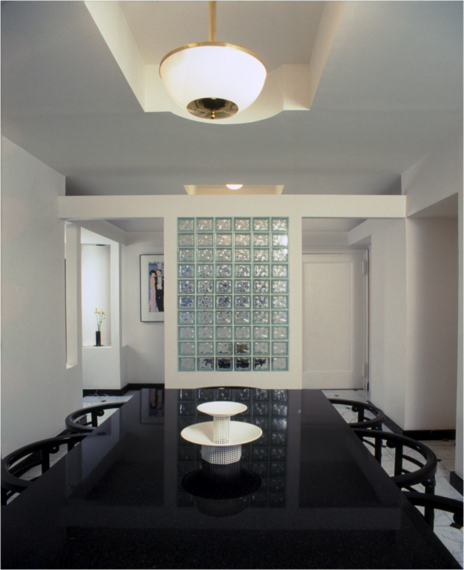 In addition to it's aesthetic advantages, there are at least five key ways in which a ceiling may be functionally enhanced: to define a specific location, to add lighting, to enhance the height of a room, to provide circulation, and to add beauty. 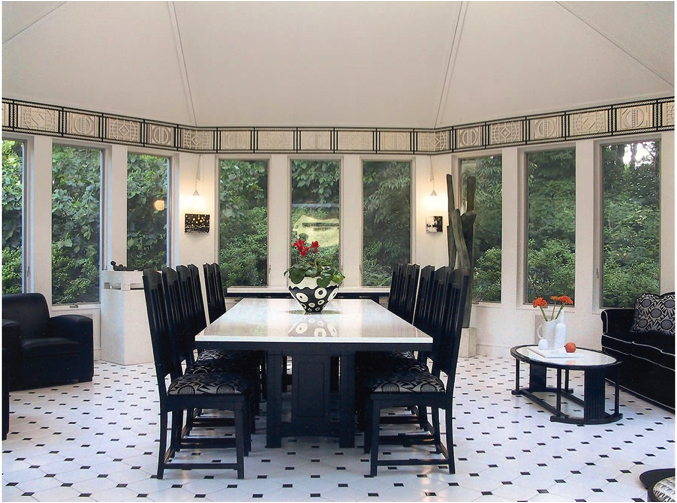 By simply decorating or carving out some definitive section of the ceiling, the designer can create a distinctly different space. While the newly defined area will look different only on the ceiling, its design will impact the surrounding areas to affect a difference in feeling. This transformative feeling is a result of redefining the space and turning it into, perhaps, an entry foyer, an ante room, a hallway, a dining room, etc. So, by a simple architectural enhancement to the ceiling, you have a new kind of space. For instance, if you have a non-descript entry foyer, carve out a small portion or the ceiling (it may be as small as 6") into a square or round shape to create a difference in height. This simple change will define the entry so that it becomes a more distinct location. You can further enhance its serving this purpose by adding other elements, like a mirror, console, and overhead pendant light fixture. 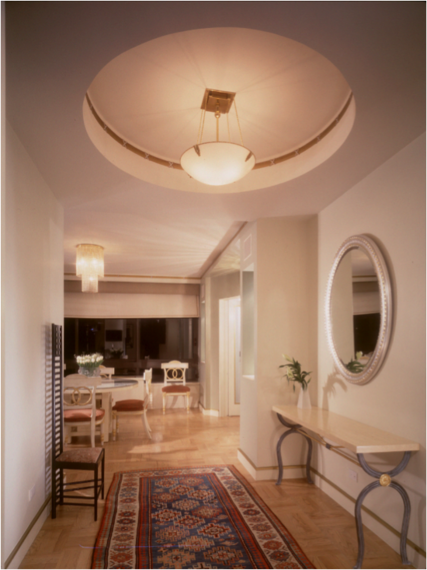 Ceilings that include special lighting effects, such as cove lighting, add a warm, elegant aura to a space. In place of or in addition to a beautiful chandelier, it is possible to create more subtle light effects such as cove lighting. Here, the physical bulbs (fixtures) are hidden from plain sight, yet the light arises from within a concealed part of the ceiling, creating an ethereal glow that lights the ceiling above. Usually placed around the perimeter of the space, the light is thrust upwards onto the ceiling plane, with stronger glows toward the light source and softer ones in the center. In addition to simple white colored bulbs, colored effects may be similarly achieved through colored films or bulbs, casting a blue, green, yellow, or just about any color. 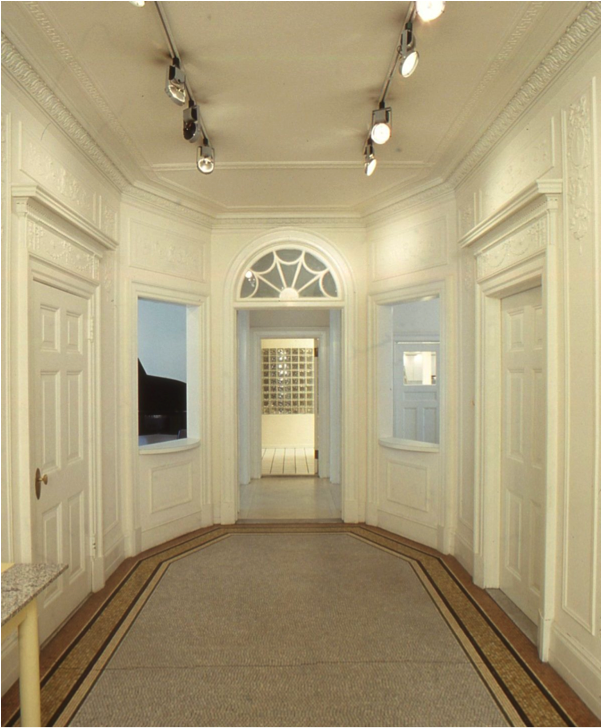 As an alternative to an upward thrust of light, a similar effect may be achieved through concealed down lighting. By creating a slit into part of the ceiling, into which you place the hidden bulbs, the light is reversely shed onto the walls below. 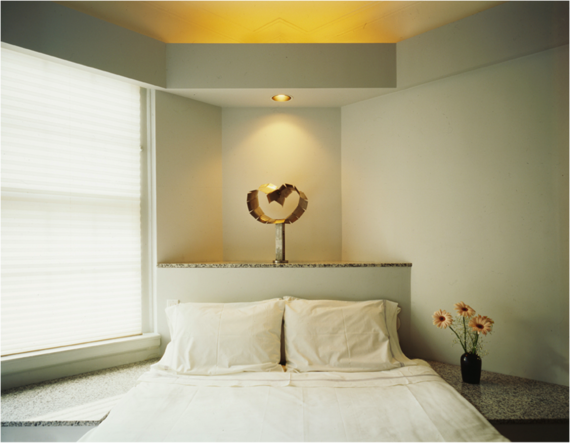 This, too, evokes a very subtle serene feeling, adding a sense of warmth to an area. Thirdly, placing lights in soffits and strip lights above the soffit can create an interesting array of effects. Here, you can see the face (bottom) of the bulb, but not the entire fixture as it is built within the dropped piece of ceiling. Soffit task lighting is of great value in kitchens for seeing food and on walls where there is artwork that has to be highlighted. And, lastly, there may be hidden strip lighting hidden on top of flying beams or high walls that don't quite reach the ceiling. In these cases, the small strips with tiny bulbs are also hidden from view, yet the light they cast is thrust upwards onto the ceiling. Feel your ceilings are too low? Here is a design sleight of hand that is highly effective. By simply either dropping or raising a portion of the ceiling plane by a mere 6" or so, you can give the illusion that part of the overall room is much taller than it is. Raising or lowering the ceiling height in one specific location can also define a separate space. 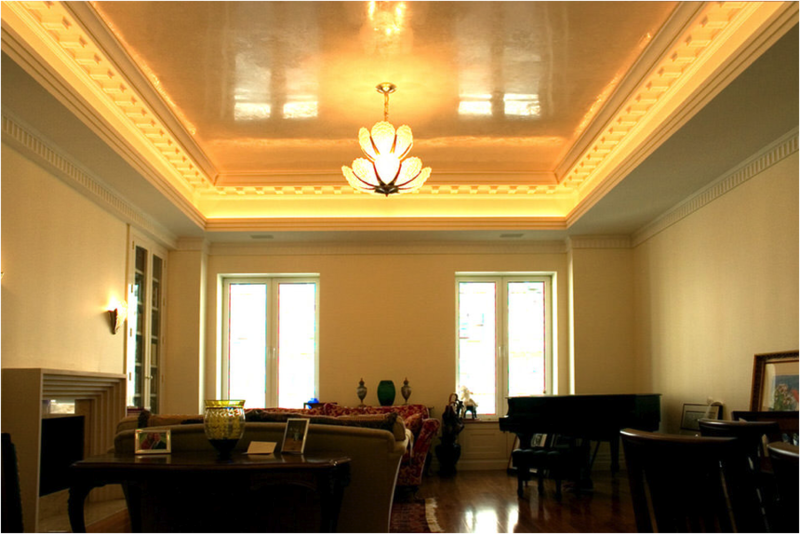 For instance, you want to give your living room 8' ceiling a grander feel making it look taller than it is. Simply, lower a portion of the ceiling that lies right outside of that room, be it a hallway or foyer, and you will create the illusion of the LR ceiling being much taller than 8'. 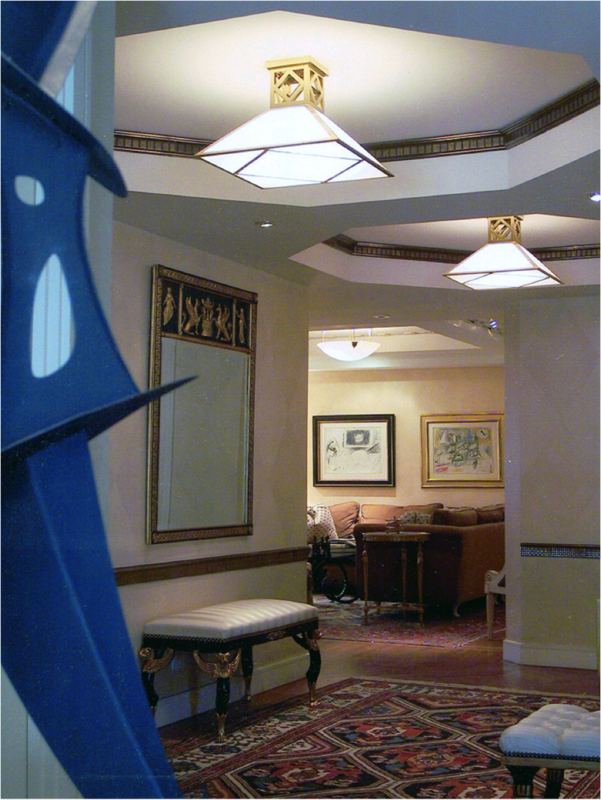 By carving out the ceiling in a particular shape, you can redirect the flow and circulation of space. The visual appearance of say an oval or round entry can redirect you in a certain pathway, subtly leading you to your destination. 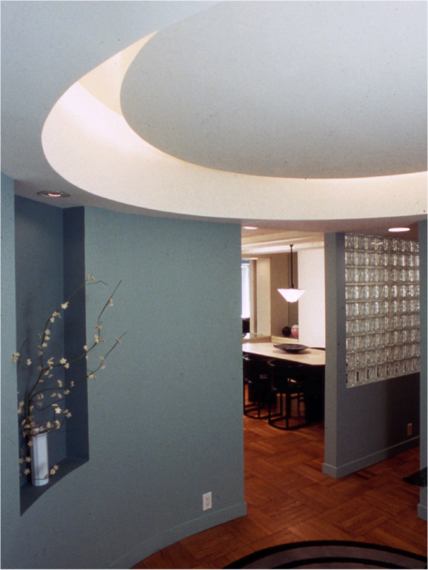 So, rotunda ceilings offer gentle circulation, space, and open access to multiple different areas. A square or rectangular ceiling structure is more pointed in telling you where to go. 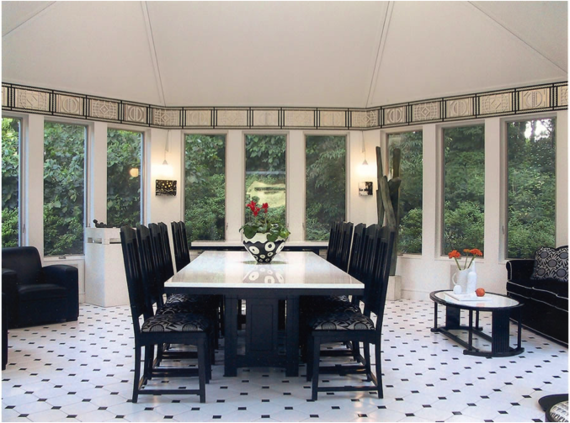 Stately octagonal ceilings offer a bit more privacy. They allow for doors for entry into adjacent spaces, but still keep the main area open and flowing. Any shape will evoke a feeling of passage through its curves and angles to the space ahead because even though the shape is on the where to go ceiling, you "feel" it moving you along. Creating beautiful ornamentation on the ceiling enhances the overall appearance of an otherwise flat plane. Aesthetic embellishment may be accomplished in a variety of ways: molding appliqué, color, ornamental plasterwork are a few. 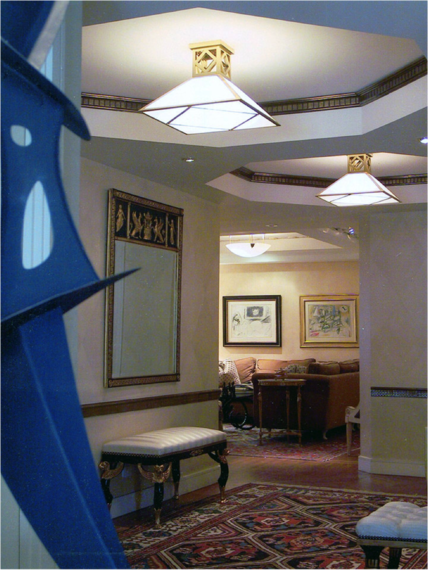 Molding appliqué lends an elegant, geometric feel to the space. It better defines the subtly of the form created by outlining with strong emphasis. 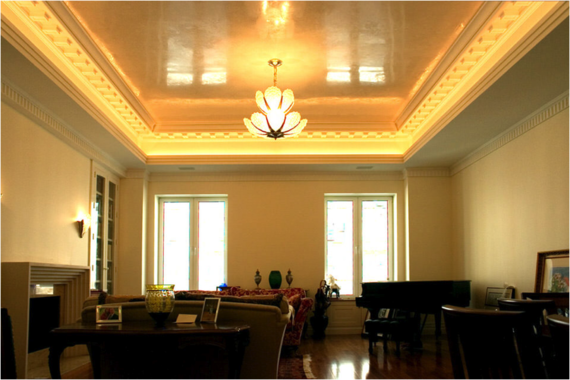 You can apply the molding near the ceiling or lower at the perimeter of the ceiling opening. Alternatively, you can paint the raised part of the ceiling a different color or apply some type of decorative paint technique, making it more decorative. 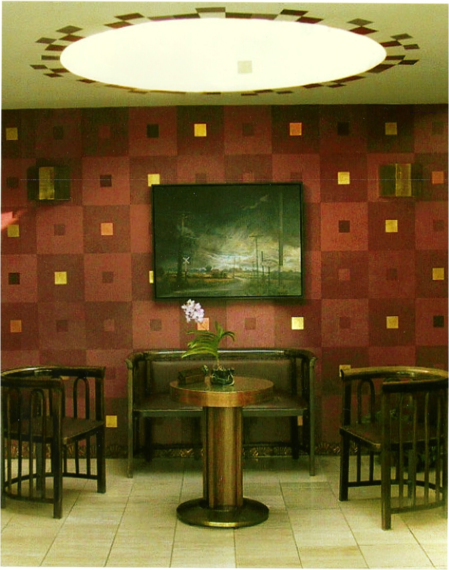 Adding color is an inexpensive way of distinguishing spaces. 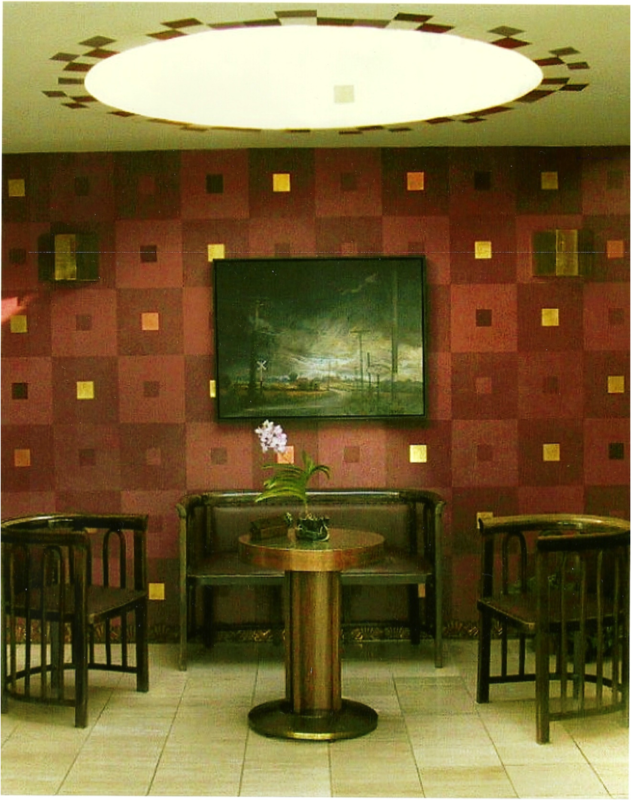 Gold leaf is a beautiful, luxurious alternative. Finally, for the more ambitious, you can add ornamental plasterwork in any pattern or color to enlighten the surface above. 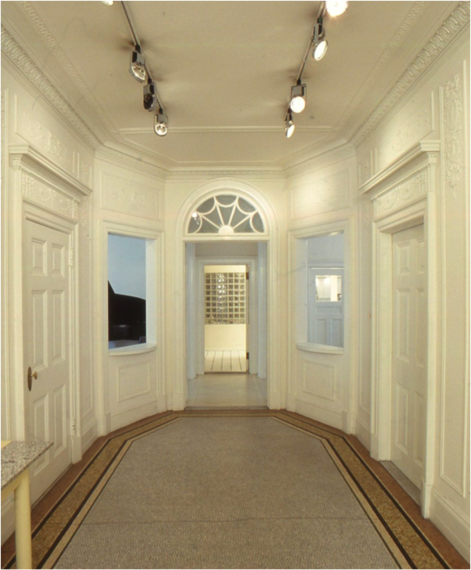 Decorative plasterwork adds visual interest and again divides the space into different functional areas. 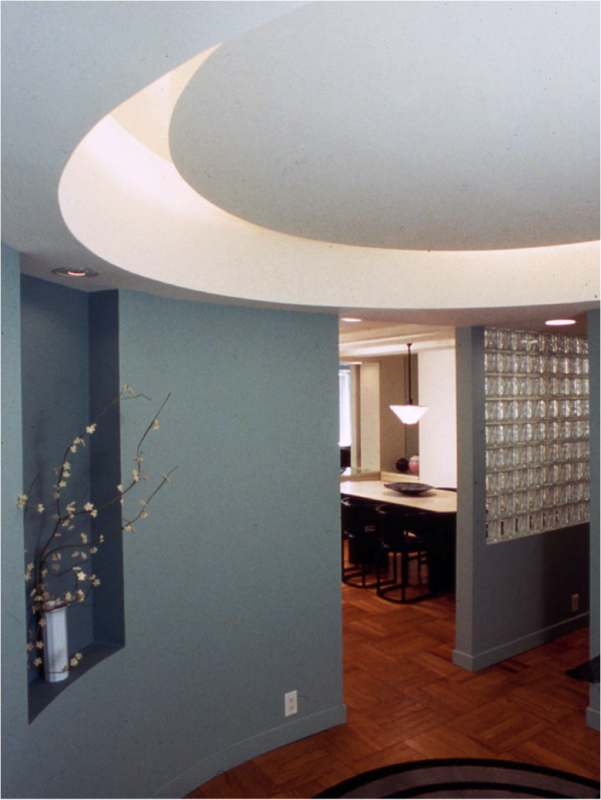 Though often forgotten, ceilings functionally help define space through both architectural and decorative means. Whether by defining a specific location, or by adding lighting, by enhancing the height of a room to provide for better circulation, or by enhancing a room's beauty, ceilings are an essential and pivotal plane in achieving functional and aesthetic excellence.